Award season kicked in a few weeks ago and today the Oscars is back to celebrate film! But it wasn’t any old Oscars this year because the cast of Crazy Rich Asians took the Red Carpet to a whole new level of fashion. Since we did a fashion rundown of the Crazy Rich Asians cast at the Golden Globes early this year, it felt right that we do it again for the Oscars! Check out our Golden Globes fashion rundown of the Crazy Rich Asians cast here. Seems like she’s giving us a Belle moment (from Beauty and The Beast) and honestly, we’re loving it! The actress stunned the Red Carpet with a bright yellow Versace dress which she paired with very minimal but some accessories to give the look an elegance glow. 2. Gemma Chan rocks Valentino once again! 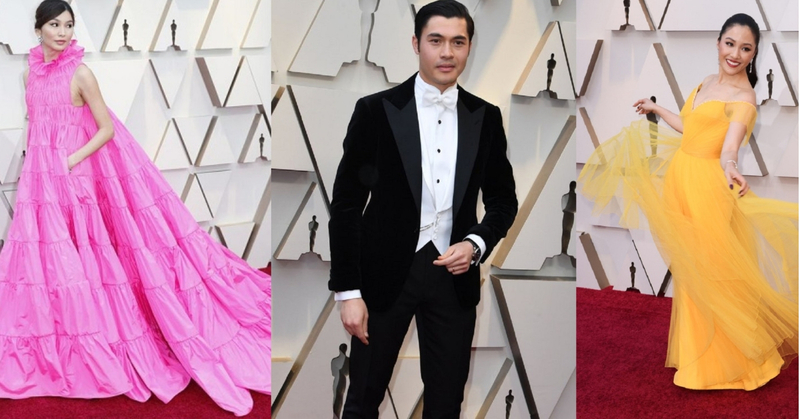 Looks like Gemma Chan loves Valentino because the last time we saw her at the Golden Globes she rocked a blue Valentino gown but at the Oscars today she gave us a hot pink look that we’ve all been waiting for! A good choice made because, hot pink seems to be a trend at the Oscars this year too! 3. Looking like a boss, Awkwafina! Awkwafina took the red carpet pulling off a chic sparkling /Glittery silver pantsuit by DSquared2! 4. Michelle Yeoh looking like a Queen! Jaws were dropped when Michelle Yeoh took the red carpet by storm by working an elegant sequined gown by Elie Saab. The Off-the-shoulder gown looked stunning with shining Jewellery by Chopard and Richard Mille that complimented the gown in the best way possible. Golding walked the Red Carpet with a Purple Ralph Lauren tuxedo and without a doubt he looked dashing as always.